Gentatsu and his men slowly move in the bamboo. 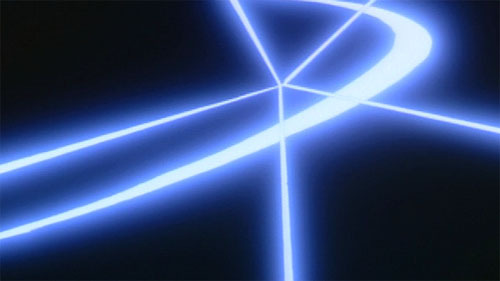 Gentatsu charges at the meeting house. he throws his cloak off and draws his sword from his sheath. He slashes the first man in his way by drawing his sword from his sheath with great speeds. 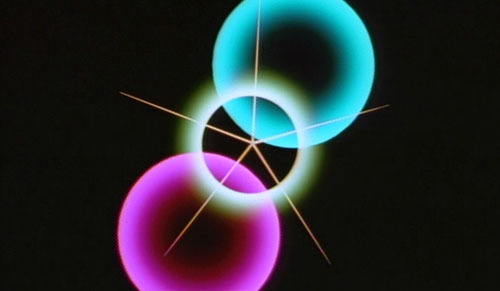 He slays two men with two stokes of his sword. He slashes it downward to throw off the blood on his blade. 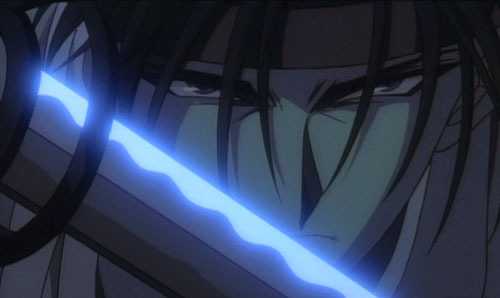 He spots kenshin slaying his comrades. They prepare for battle and charge at one another. Their swords clash together. 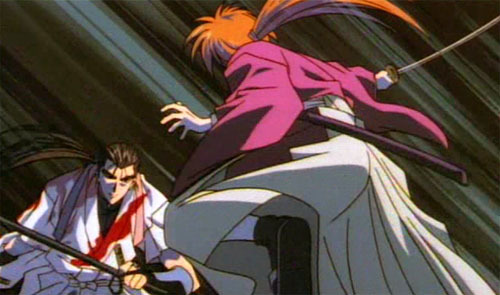 Kenshin knocks gentatsu backward, and then leaps at him going to slash. 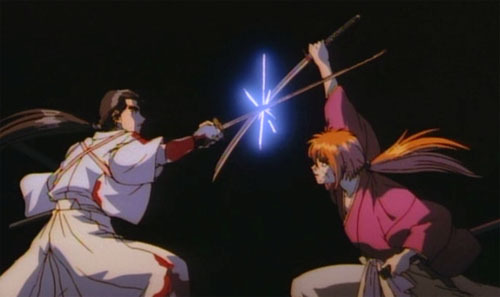 Gentatsu swings his sword but kenshin disapeared. Gentatsu turns around to lok above him. 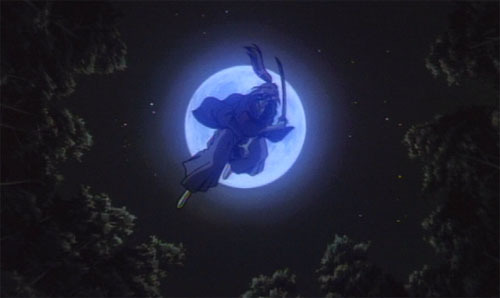 Hee sees kenshin in the moonlight up way above him in the air. 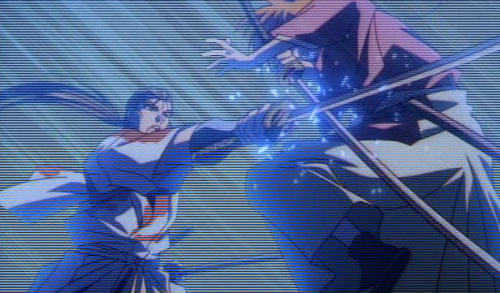 At the last moment he swipes his sword up while kenshin slams down with his sword. 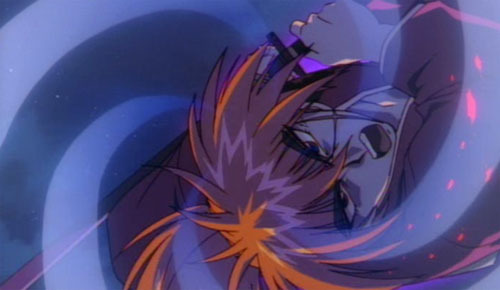 Kenshin's swords slams down on Gentatsu's sword as he tried to the attack. 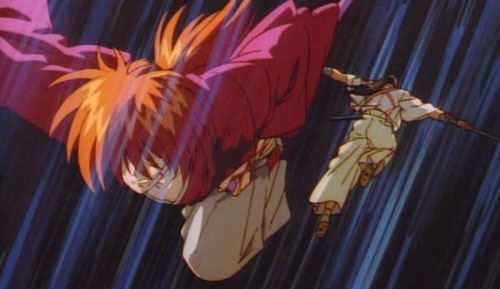 Kenshin lands on the ground. Neither swordsmen make a move for a few minutes. 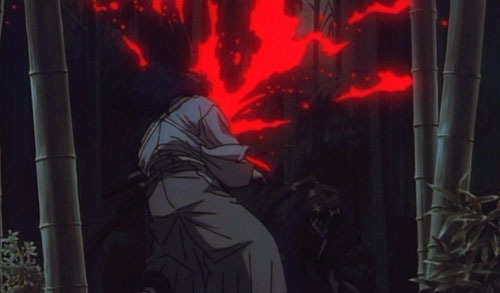 Gentatsu's headband breaks in two and his sword shatters to pieces because of the force of kenshin's attack. he starts to bleed down his face. Gentatsu then beginns to spray tons of blood out of his head as he falls to his nees. 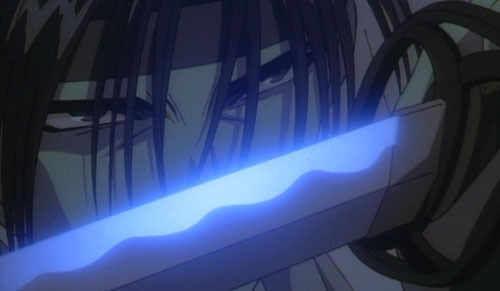 Kenshin sheaths his sword and walks away. Shigure's fightigs style was used indoors. His attack can come left, right, above, or below. 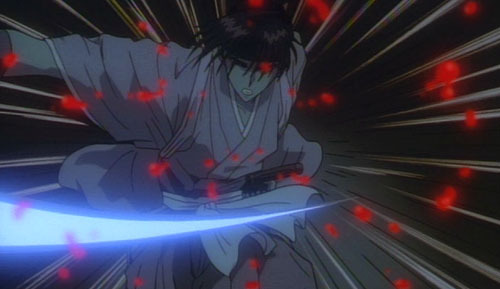 Kenshin counters his attack. Shigure tries his first technique of the kanuma style. He attacks wih his iron sheath, then thrusts wth his sword. 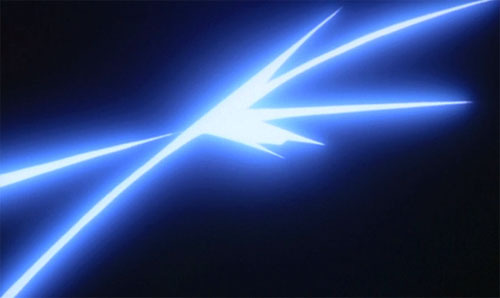 Kenshin jumps right beore it connects, and tries to use Ryu Tsui Sen, but Shigure memorizes his attack and goes for his erasing sun slash. Shigure goes for a single handed thrust at kenshins leg, but he counters it at the last momment. They land and shigure throws his iron sheath at kenshin and hits him in the left shoulder. He continues to attack his left arm untill its almost useless. 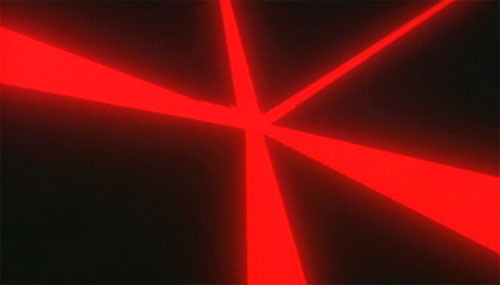 Kenshin only needs one attack on him. They both jump into the air. 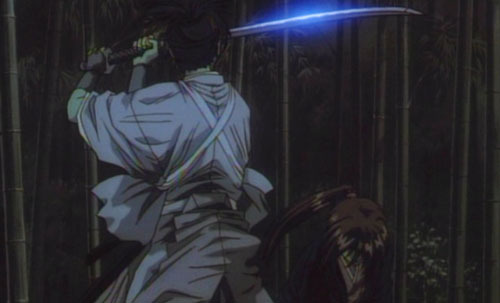 Kenshin uses the spinning of his body o draw his sword and Shigure improvies with both his swords. 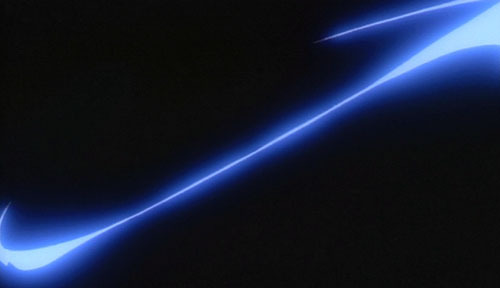 Their swords clash together in mid air and it seems as if they have countered each others attacks. 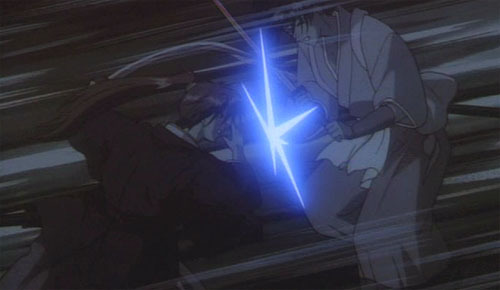 Shigure's attack failed and he was slashed by kenshin. 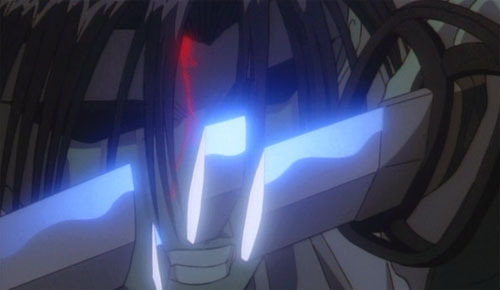 Shigure forgives kenshin for gentatsu's death 10 years ago.